Home / General / Why do people live longer in Japan? Why do people live longer in Japan? Why are Japanese people living so long? Can we learn any lessons from them? How long do people live to in Japan? According to the World Health Organisation (WHO) Japanese women have a life expectancy of 87 - the highest in the world, while male life expectancy is in the top ten internationally, ahead of the US and UK. Why is this? Is it the Japanese Diet? However, in 2011 the Lancet suggested the dietary picture is more mixed. Some aspects of the Japanese diet (like a preference for highly refined rice and bread as staples) could be responsible for increasing rates of diabetes, through a low dietary fibre intake and a high glycaemic index. The traditional Japanese diet is also under threat as more western food chains and dietary habits become popular. This has led to a rise in obesity in Japan, and as a result, increasing cases of hypertension (high blood pressure) and other adverse health outcomes, such as breast cancers. Despite this obesity rates in Japan are still very low, with around 3.8% of men classed as obese and 3.4% of women, compared to 24..4% of men in the UK and 25.1% of women. Is it the healthcare system? Since 1961 Japan has had universal healthcare, with equal and universal access to healthcare for all, through a health insurance scheme (paid for by government, employers and individuals). As such, Japan performs well when looking at the social determinants of health. In Japan regular check-ups are also the norm. Mass screening is provided for everyone at school and work or in the community by local government authorities. This may help people become more health conscious. However, the financial and social underpinnings of health provision are threatened by economic decline and widening inequalities. In conjunction with rising costs and an ageing population this raises the question as to whether healthcare can remain universal forever. Japan provides its universal healthcare for around 10% of its GDP (Gross Domestic Product). That's slightly more than the UK’s 9% but quite a bit less than the USA’s 17%. Does this mean that Japanese people are using less healthcare than their US counterparts because they are healthier, or is their healthcare system more cost effective? Either way universal coverage with manageable expenditure seems worth aiming for. Do Japanese people exercise more? Some studies suggest not. For example a 2009 study concluded that Japan was one of four countries where less than a third of their population was in the high physical activity category. However, some observers argue that everyday life in Japan involves more commuting by public transport than by car, meaning more daily exercise than, for instance, in the US. Do Japanese people have better genes? There is some evidence that Japanese people have good genes which are aiding their longevity. Studies have suggested two genes in particular, DNA 5178 and the ND2-237Met genotype help the Japanese live longer, by protecting them against some adult onset diseases. However, this isn’t seen across the whole population. Some families in Okinawa for instance, have inherited more good genes than others. And even here other factors, including personality (especially conscientiousness, openness and being extroverted) also seem to be important. Are there any downsides to the Japanese way of life? Since the 1970s there have been discussions of ‘Karoshi’ – death by overworking. Since 1987, the Japanese Ministry for Labour has been publishing figures on ‘Karoshi’, as companies were encouraged to limit working hours. The biological aspects behind these deaths are linked to heart disease, high blood pressure and strokes. Not only is there death due to overworking, but suicide rates in Japan, especially for young men, are also very high and are linked to overworking – known as “karojisatu”. The highest risk of suicide is seen by those in managerial and administrative jobs, where stress levels are high, as well as in those with low social support, lack of control over work and heavy workloads. So what lessons can we learn from Japan? A healthy diet can help you live longer, wherever you live. So follow government healthy eating guidelines. Universal healthcare, with equal access to all (as we also have in the UK) helps too. We shouldn’t underestimate the value of social cohesion - the sense of belonging to organisations and communities. We need to consider how to achieve this both as individuals and as a society. 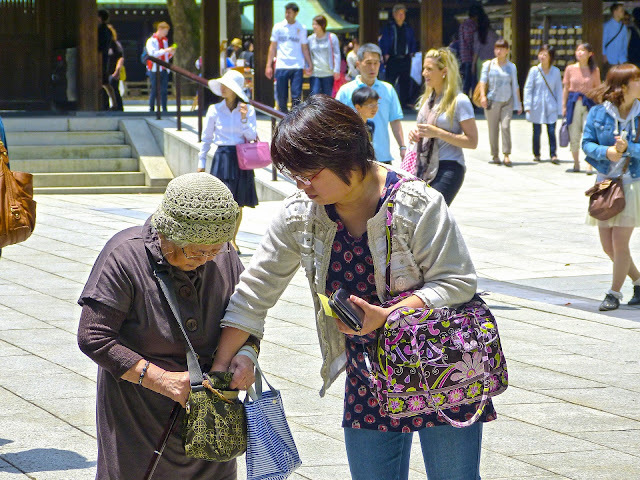 Avoid the factors that risk reducing longevity in Japan, like fast food and overwork.